Mixed Salad Annie: My new favorite snack! To think, I almost sold this baby for $5.00 at my yard sale! I don't know what I was thinking. Well actually I do. When I bought this air popper years ago, I had healthy snacking in mind. But being so used to oil popped corn, the texture and flavor was far from what I imagined. The popcorn came out dry and tasteless! So you must be wondering why I am raving about it now. Well, I guess I never read the instructions and tips for the popper. The instructions are something I rearly study, but since I decided to use this relic after so many years, I wanted to make sure I had the measurements right and so on. In my reading, I discovered a section on tips for successful popping! It actually said that if you are used to the flavor of oil popped corn, that you could add oil to the popped corn before salting. 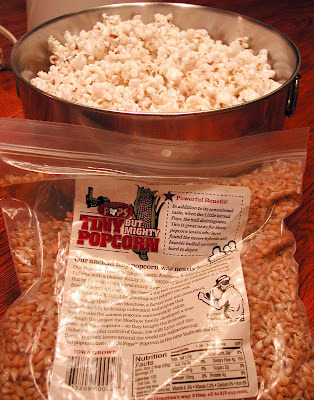 Ok, I know this isn't rocket science, but I would have never thought of adding oil to the popped corn. Butter, yes but not oil. This was a revelation for me since I try to avoid butter if at all possible. Plus by adding fresh raw olive oil to the corn after it is popped and not before, it is much healthier. Raw olive oil is great for your heart you know! I tried a new popcorn too! This popcorn is really tasty and has a great benefit for those who find the newer varieties and heavier hulls of popcorn hard to digest. When the tiny corn kernel is popped, the hull discinerates. Pretty cool, huh? There is also an interesting story behind this popcorn which you can read on their website. Oh my goodness! We use that same popcorn! It's a small world. 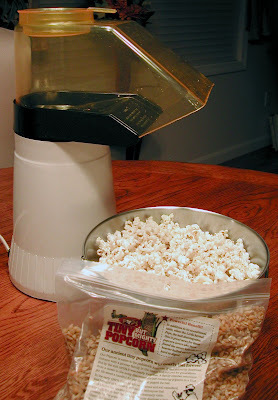 I love popcorn...what if you put olive oil, Asiago, maybe some herbs on it? Do you think that's too crazy? I bet my family wouldn't eat it.